A couple of weeks ago, I was invited to join my parents for some speed training and conditioning at my little brother's high school in D.C. I know that sounds weird, but I am not using any metaphors, people. This is real life! There is a nice football field at the school that is basically empty on Sunday mornings. This field would serve as the perfect location for sprints and lots of sweating. Fortunately, the ground was dry, because there is no fun in running on a slippery surface! The temperature was great for running sprints outdoors in the late fall, and there wasn't much wind to add more difficulty to the workout. Now, before I go over the workout, I have to explain that I did not come up with the workout. My dad used to be a high school football coach, and the workout is all his! I was just a willing victim that day, and got some pictures in for you lovely readers. The numbers correspond to yards, which my non-American/British readers may not appreciate, and I'm sorry. :-( Just for your reference, a yard is almost as long as a meter. It is just barely shorter than one meter. So, what will you need for this workout? Comfortable clothes that you can actually sprint in. I make this distinction because you will want something that fits closer to the body so that your clothes don't slow you down. You're going to be sweating more than if you were just jogging, so you want to make sure that you aren't going to get too hot. I wore my sunglasses while running because I didn't want any bugs flying into my contacts. Ew. You're also going to want to make sure you have plenty of hydration on hand. 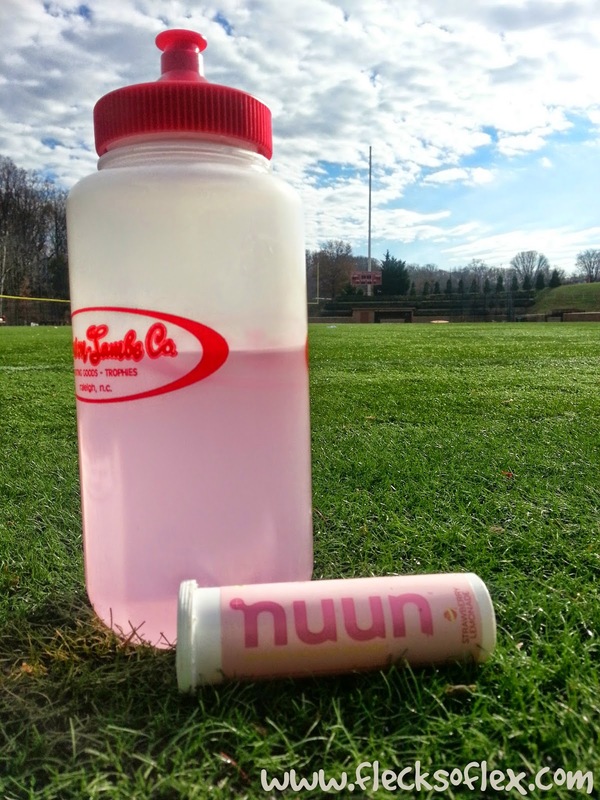 I love to use NUUN tablets, so I threw a couple into my water bottle before driving over to the field. None of the sprints require a timer, so you won't need that. You might need a towel if you're a sweaty Betty. Other than that, and clearance from your doctor of course, you're ready to go! Keep in mind that I am not a certified trainer, so these are workouts I have personally done, but it also means that if you do it as well, you do so at your own risk. Here's the workout, with a pinable image (at the bottom) to save for future reference! Line Touch Sprints -- You probably know this by another name, but you'll likely know this exercise. Start at the end zone. Sprint to the 10 yard line. Once you touch the line with your foot, turn back and sprint to the end zone. Sprint to the 20 yard line. Sprint back. Sprint to the 50 yard line. Sprint back. Sprint to the end zone on the other side of the field (100 yard line), and sprint back. Jog two laps around the outside of the field as a cool down. Have you ever done a workout with your parents? 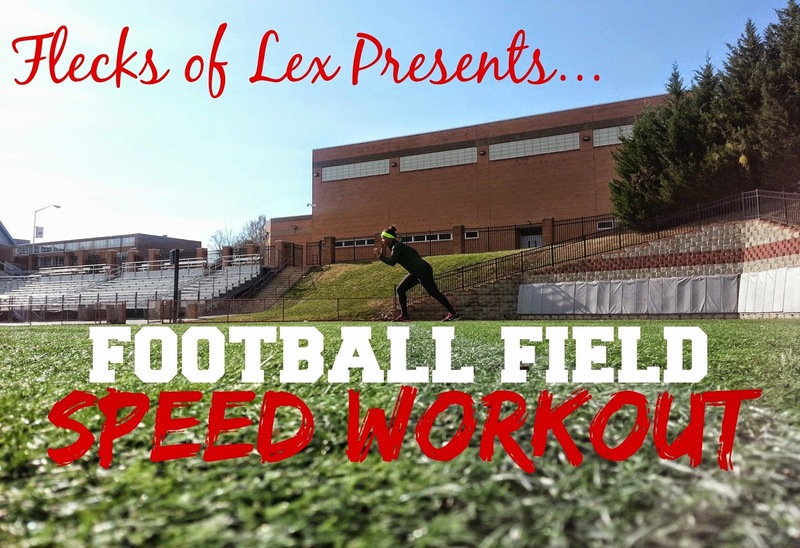 Have you ever had a workout on an American football field? Did the field seem smaller than it looks on TV? What do you use to hydrate during a tough workout? I am not a fan of speed work. I do it but I don't love it. I'm more of an endurance, long distance kind of girl :) I bet it was fun working out with your family though! 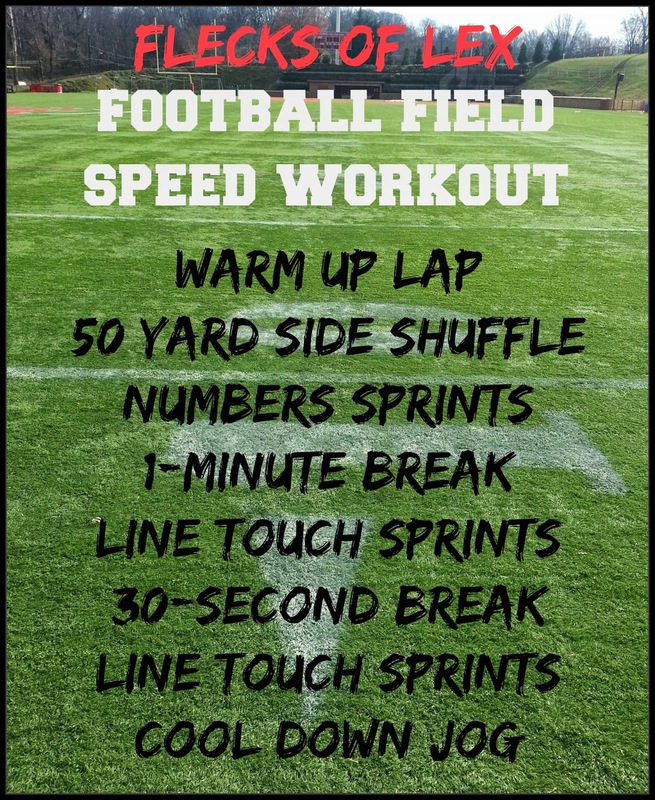 I've trying to get faster on my long runs, so I've tried to fun ways to incorporate some speed training into my workout routine. Plus, it helps me out for volleyball! I really enjoyed it. My parents are in really good shape! Thanks for stopping by!